Have you ever toured the Doctors House and wondered what it would be like to pull up a chair in the dining room for a feast? As you may have heard, a raffle is about to take place for just that! 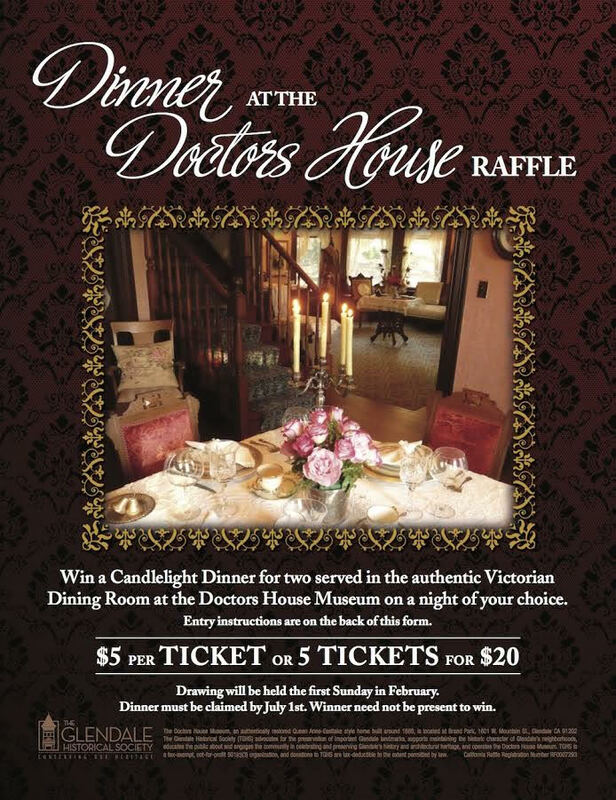 The winner will be treated to a specially prepared, romantic meal for two in the privacy of the Doctors House dining room. Tickets for the raffle, which are $5 each or $20 for five, can be downloaded here. Just print and fill out as many tickets as you wish to purchase and send them in with your payment by check and you will be entered in the drawing. Mail the completed tickets and check to TGHS, P.O. Box 4173, Glendale CA 91202. Or, visit the Doctors House for a Sunday tour between the hours of 2 pm-4 pm and purchase then. All entries must be received by January 31. Do not delay! The drawing will be held on February 3. The winner can schedule the dinner anytime between February and the end of July 1, 2019, subject to availability. Due to California law raffle tickets cannot be purchased online hence the mail-in entries. The Doctors House Museum, an authentically restored Queen Ann-Eastlake style home built around 1888, is located at Brand Park, 1601 W. Mountain St., Glendale CA 91202. The Glendale Historical Society (TGHS) advocates for the preservation of important Glendale landmarks, supports maintaining the historic character of Glendale's neighborhoods, educates the public about and engages the community in celebrating and preserving Glendale's history and architectural heritage, and operates the Doctors House Museum. TGHS is a tax-exempt, not-for-profit 501(c)(3) organization, and donations to TGHS are tax-deductible to the extent permitted by law. California Raffle Registration Number RF0007293.